Teams must fly to Fredericton, New Brunswick via Toronto. Once there, teams must make their way to Officers’ Square in the Garrison District. Here, teams must observe and compare a changing of the guard here and in front of City Hall. Once they point out the one difference, they will receive the next clue. Martina & Phil spot the correct difference and can now face the Detour: Fit or Fly. Both Detours are at CFB Gagetown. 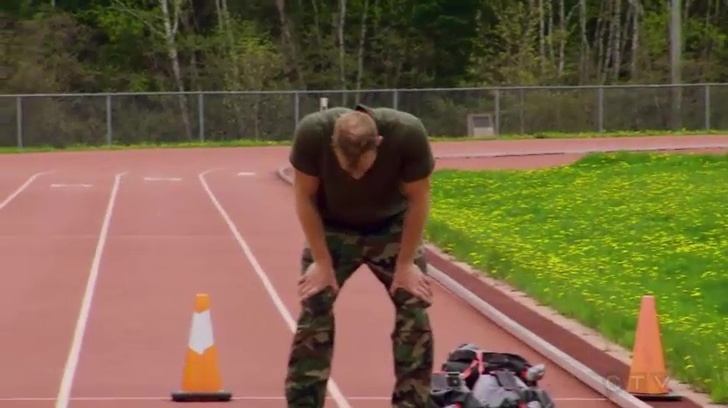 In Fit, both team members will complete a Race version of the military’s Force Fitness exam (20 metre rushes, sandbag lifts, intermittent loaded shuttles and a sandbag drag) in a combined time of 18 minutes. Only one Racer can complete the exercises at a time. 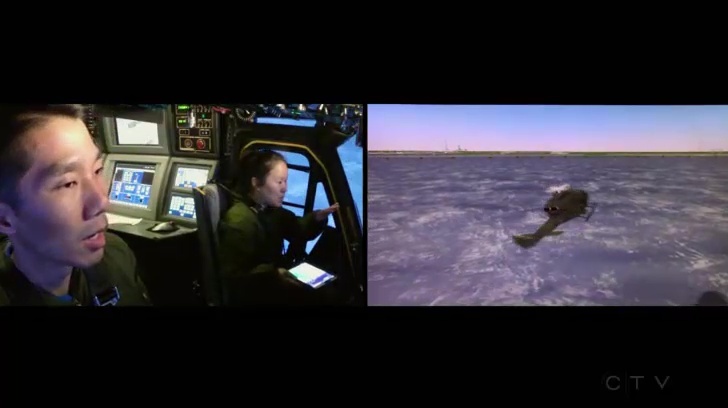 In Fly, teams must locate the Bell Centre in Montreal during a flight and land on it during a flight simulation. This is a Limited Stations Detour. Martina & Phil choose Fly while Dylan & Kwame choose Fit as do Taylor & Courtney and Courtney & Adam. Taylor & Courtney try to take Courtney & Adam’s taxi, but the driver is loyal. 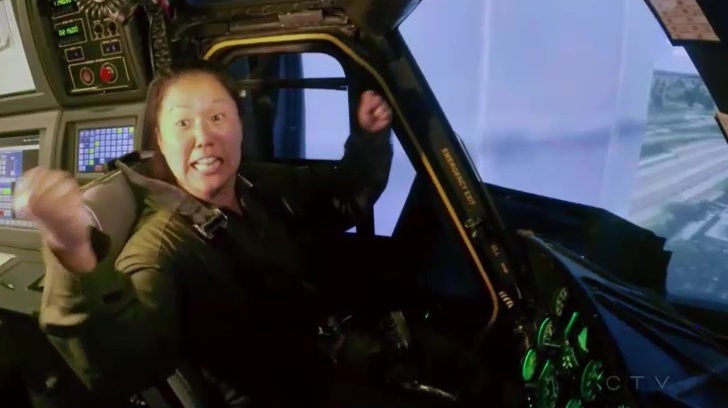 Taylor & Courtney arrive last at the Fit and decide to try the flight simulation instead of waiting for a spot at the Fitness. Martina & Phil are on their 7th attempt and they finally find the Bell Centre, but Martina can’t properly land the helicopter in five minutes. They have to switch out for Taylor & Courtney to have an attempt. After a couple of restarts, Dylan & Kwame are finally able to get each exercise down and get the next clue… a Face Off! 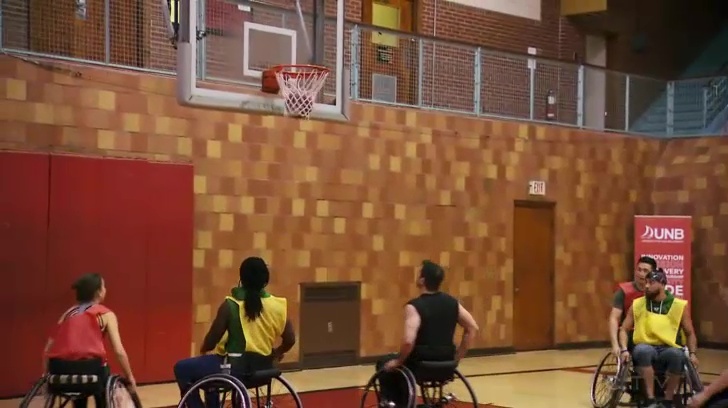 For this Face Off, teams go head to head to compete in a 15 minute game of wheelchair basketball. Taylor & Courtney are able to land on their first attempt so it’s them vs. Dylan & Kwame at the Face Off. Adam is tired after his attempt at the fitness so Courtney gives it a try while he rests. She does well until the final exercise. They decide they can’t go through that again so they have to switch. When they get to their taxi, Adam realizes he forgot the clue in his uniform pants so he runs back to grab it while Courtney waits in the taxi. Martina & Phil are on their 12th attempt, but Martina still can’t land. Taylor & Courtney beat Dylan & Kwame. They open the next clue revealing the Road Block: Who thinks a picture is worth at least one word? 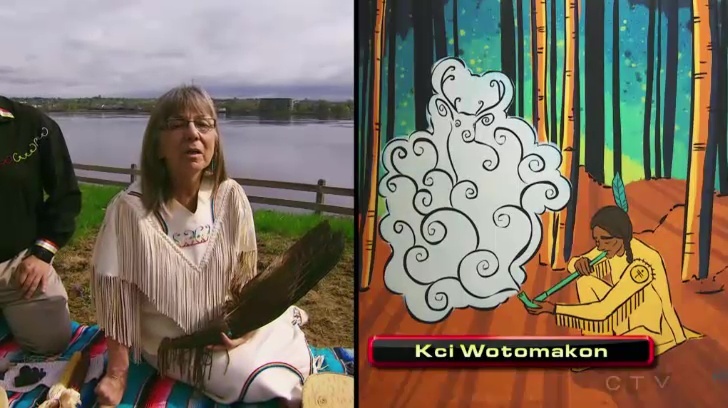 For this Road Block, teams must identify six paintings in Wolastoqey by listening to an elder, Imelda, who will ask them questions. Taylor decides to do the Road Block. Back at the Detour, Phil feels very sick after their 14th attempt. Courtney & Adam fail their 3rd attempt. Martina & Phil are on their 18th attempt now and Martina finally lands. Courtney & Adam land on their 4th attempt. Dylan & Kwame take on Martina & Phil at the Face Off and Dylan & Kwame easily win 22-8. Kwame starts the Road Block as Taylor gives his 6th and final answer. Taylor & Courtney head to Government House and check in as Team #1. They win a trip to Buenos Aires, Argentina. Back at the Face Off, it ends a tie game. They go to Sudden Death. Martina & Phil get the ball first, but Phil misses the basket. Adam makes the basket and he decides to do the Road Block. Martina & Phil have to wait out their penalty. Martina decides to do the Road Block. Over at the Road Block, Adam decides to memorize the English descriptions of the paintings first. Kwame gives all the correct answers and he and Dylan claim the 2nd spot in the Final Leg. Adam goes for his first attempt, but doesn’t seem to understand the task. He re-reads the clue as Martina gets started. Adam then gets all six answers correct and he and Courtney leave. They step on the Mat and Jon checks them in as Team #3. That means Martina & Phil are last and eliminated. So this was a pretty badly designed Penultimate Leg. I really believe that you can’t put these artificial and forced road blocks (not Road Blocks) that keep teams from moving forward, especially on a Penultimate Leg. Let them Race! No First Come, First Served tasks. No Limited Stations. And definitely no Face Offs. 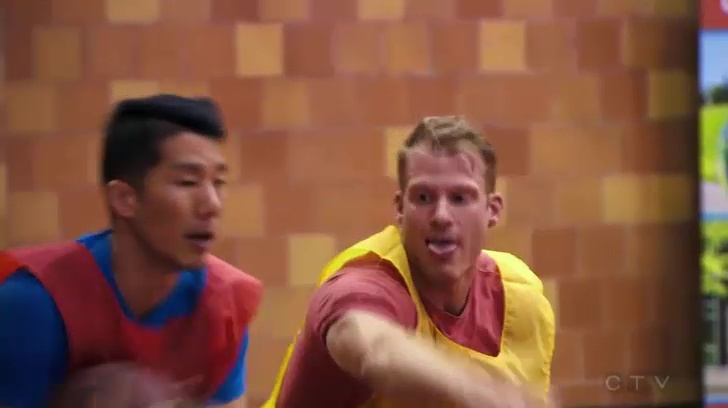 Seriously, what is TAR Canada’s obsession with Penultimate Leg Face Offs? It’s almost as dumb as TARUS’ end-of-Leg Head to Heads. Anyway, the task themselves on this Leg were okay. Like last year, this would’ve actually worked much better as an early Leg and not a Penultimate Leg. The guard ceremony was a very, very simple, almost last minute task they threw in. Unexciting. And a typical TAR “learn the routine” task would’ve been better. Though still would not have helped Leg Design. The Detour was certainly a perfect fit for this Heroes Edition as a tribute to the military. But again, making it Limited Stations plus having only one flight simulator was just not good for Racing. Especially on this critical Penultimate Leg. I shouldn’t be surprised about having a Face Off on the Penultimate Leg. But I was surprised about having a Face Off on the Penultimate Leg. Like, why? If it’s to create extra drama on this Leg, why not design a better Leg instead and let teams Racing side-by-side against each other be the exciting big draw. The Road Block was okay, but it certainly didn’t appear as difficult as it sounded. If anything, teams should’ve all given the answers at once, not give one answer then come back again. The episode didn’t make clear if teams had to go through all six answers again on each attempt. 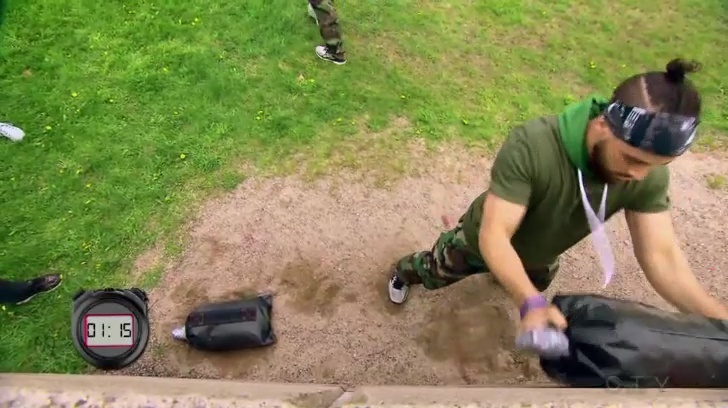 Also, what was up with that whole scene of Adam forgetting his clue in his military pants? I honestly thought them specifically showing Adam going back to grab the clue in his pants and leaving Courtney in the taxi was because they’d be getting a penalty for the distance rule. Maybe they did and it didn’t matter if Martina & Phil were so far behind. Or TAR Canada doesn’t enforce that rule. But I really thought they’d get a penalty for that. Oh well. Overall, a poorly designed Leg with okay tasks. Certainly not anywhere close to the garbage (literally!) TARC3 Penultimate Leg. But still not very good. This was definitely a horrible Leg for Martina & Phil. After a quick start for them, things just went downhill from there. This might have been their worst Leg of the Race actually and it’s definitely sad it had to come on the Penultimate Leg. They kept saying they wouldn’t give up, but you could see that they were growing less hopeful as the Leg went on. Dylan & Kwame said it themselves, they’re peaking at the right time. They might be in the best position to win with the momentum they have. Courtney & Adam are the darkhorses though as they also have momentum going into the Final Leg. 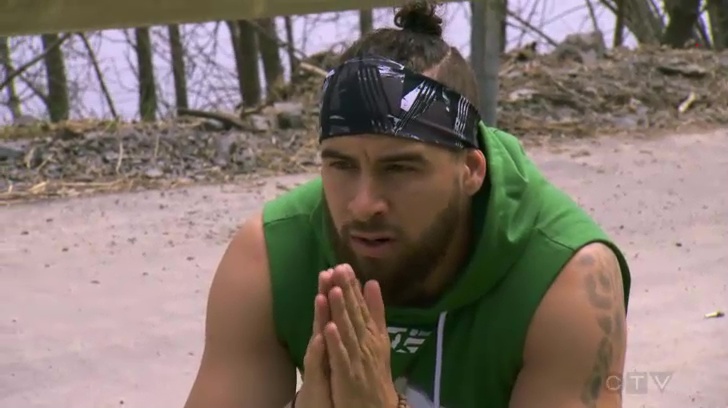 There is certainly something to the “Win the most important Leg” philosophy on TAR. And their season of bottomgodessing ends with either a big win or a 3rd place finish, I believe. Taylor & Courtney certainly have more wins, but they’ve also suffered big missteps as well. And I think that could be a liability on the Final Leg. Of course, the Final Leg itself could play a huge part (typical of TAR Canada), but they too could go either way.